Hello everyone! 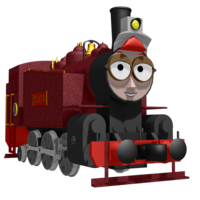 I'm Pheobe, one of the few engines that works at the Bluthsburg Steelworks, with Ralph, Arry and Bert. 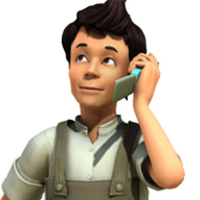 I mainly do the bigger tasks, like taking cars of steel or ingots to the Bluthsburg West Yard, where they're taken to either other destinations around Crotoonia, or to the mainland. I try to keep a cool smokebox whenever I'm shunting cars around the steelworks or delivering the steel.....Heh. Even if the cars are Troublesome Trucks. Oh. Hello there. Me name is Cardean. I help out mainly with deliveries between Celgreb City Central Station and the mainland at Norfolk, Virginia. I canne believe that I was Scottish designed, but built in one of the railway workshops on the mainland. Och! 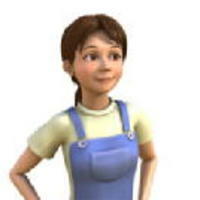 I remember the first few weeks when I arrived on Crotoonia. Very eventful, I must say. Hello there! My name is Jacob! Jacon Pneumatic! 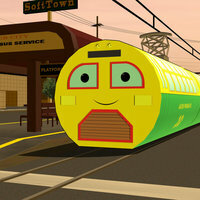 I was bought by Mrs. C. Ella to be a part of her special railway company team, The Fantasyland And Fairytale Railway Traction Company Limited, to help run the special transit line from the Celgreb City's Tramway line all the way to Pinewood Island! While I do have a bit of a friendly rivalry with Emery, there are a few things that really get under my motor. Like having to wear my snowplow! It's VERY heavy and REALLY uncomfortable! That's something that Thomas and I have in common. 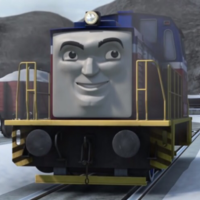 He's a Russian diesel shunter that competed in The Great Railway Show in the movie Thomas and Friends : The Great Race. His voice should sound like Bob Golding. Don't worry! I've got a whole tank full of diesel! I can push you to the next station! Then, I'll go and collect some coal for you! I still have half a tank of diesel fuel! I'll take you both to the next station! Those steamies will soon be moving again! You're welcome! Now, I'll be on my way! Oh dear! I've run out of diesel fuel! Thank you! It seems that steam engines and diesel engines can always help each other! I don't know. I never tried it on a Chugger. And you know what? You both are looking squeaky clean yourselves! Come on. Let's get you up on the rotator and take a look. Oh! That doesn't sound good. I'll get Calley to give you a tow. I'm afraid I not gonna be able to fix it today! I'll have to send for a part! Try the old spur line. 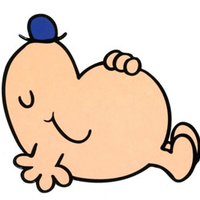 He's a character from The Mr.Men Show. His voice should sound like either Gordon Peters or Neil Crone. Oh my oh my! I must hurry! I challenge you to a race, Sonic! 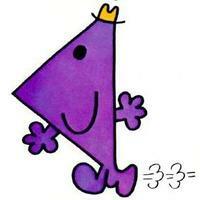 He's a character from The Mr.Men Show. His voice should sound like either Arthur Lowe, Gordon Peters, Len Carlson, Joseph J. Terry or Rob Rackstraw. Oh. It's got bits in it. What else am I gonna do on a day like today? Oh! My brand new suit! It's ruined! Oh! Perfect timing! I need to fill up on coal right away! Morning, Jodi! Where are you off to today? Whoa! These rails sure are slippery today. Thanks for stopping me, Calley. He's a character from The Mr.Men Show. His voice should sound like either Arthur Lowe, John Alderton, Arnold Stang, Len Carlson, Phil Lollar or Tim Whitnall. *sighs* Alright, let's do it. It's time for my lunch break. He's a character from The Mr.Men Show. His voice should sound like either Arthur Lowe, John Alderton, Gordon Peters, Len Carlson, Richard Epcar or Rob Rackstraw. I can't hear you! and It's SUPER! This is a very close game! Hello out there! Mr.Noisy here! I'm stuck in the restroom! She's one of the diesel engines from 2011 version of The Little Engine That Could. 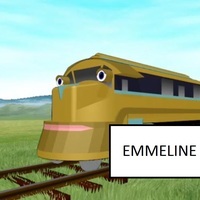 she has a twin called Emmeline. Her original voice is unknown. Morning, Emmeline! Isn't it a beautiful morning? 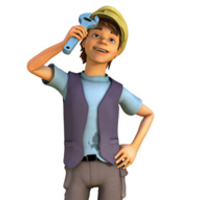 I'm off to the docks to collect some new cables fot the search and rescue team. We're on the right track now! She's one of the diesel engines from 2011 version of The Little Engine That Could. 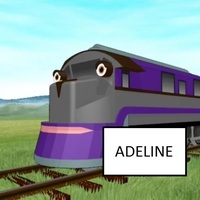 she has a twin called Adeline. Her original voice is unknown. Right! Since the cargo's loaded, I'll be on my way. Hey there! I've been sent to collect a load of slate from the quarry and take it to the junction. It's an urgent load. Henry's due to take it to the mainland today. So, I'd better get moving. Thank you, sir. I do try to be on time. She's one of the steam engines from 2011 version of The Little Engine That Could. 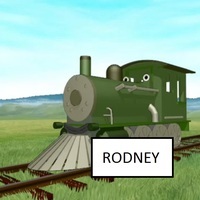 She has a twin called Rodney. Her original voice is unknown. Thanks, Pete! Next stop, Cliffstone Junction! 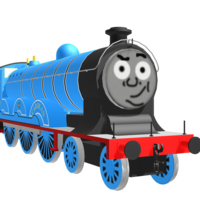 *groans*......stop that, you Troublesome Trucks!